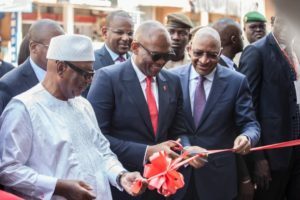 The launch of the bank’s latest addition in Mali was occasioned by the President of the Republic of Mali, Ibrahim Aboubacar Keita, who gave an unprecedented speech at the opening ceremony and the Chairman of the bank, Tony Elumelu , was the architect of the program. The Malian president praised UBA Group for the vision to expand the bank’s footprint to Mali and further commended the tenacity and commitment of UBA and its Group Chairman to the development of the continent, thus calling African financial institutions to follow the developmental philosophy of the bank and its chairman in increasing infrastructure, deepening financial inclusion and being catalysts for eradicating poverty in Africa. In his response, Tony Elumelu, asserted that UBA’s sustainability principles and philosophy, noting that “UBA is Africa’s global bank, a leading pan-African brand, was committed to democratising banking on the continent. UBA Plc, Group Managing Director, Kennedy Uzoka, expressed his enthusiasm on the Group’s operation in Mali, saying that they are in Mali to offer world class financial services that will surpass the expectations of their customers, adding that UBA was poised to deliver excellent services to the entire population of Mali.